The Central Coast Wetlands Group utilizes the USEPA's Level 1-2-3 framework for wetland assessment. Level 1: CCWG is active in the development of standard wetland mapping tools for the State of California through the development of a Wetland Status and Trends program. This program will track the extent and condition of wetlands using probabalistic methodologies over time. We are also pursuing resources to quantify and map agricultural and urban BMPs and riparian habitats on the Central Coast. Level 2: CCWG is the Central Coast lead for the development and implementation of the California Rapid Assessment Method. Since 2002 we have assissted in the development of the riverine, estuarine, depressional and bar-build estuarine wetland modules. Addiitonally, CCWG is an active member of the state Level 2 Committee of the California Wetlands Monitoring Workgroups and holds multiple trainings annually in the methodology. Level 3: CCWG has experience with Water Quality collecting, benthic invertebrate sampling, vegetation surveys, soil surveys, and was the California field team for the USEPA's 2011 National Wetland Condition Assessment which utilized both Level 2 and 3 methodologies. 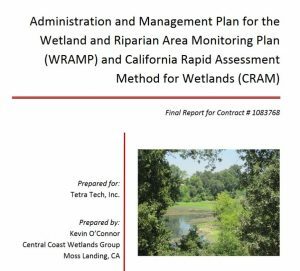 California’s Wetland and Riparian Area Monitoring Plan (WRAMP) is a framework of monitoring and assessment tools for wetlands and streams in California developed by the California Wetland Monitoring Workgroup (CWMW). WRAMP is intended to be used by state regulatory and grant management agencies to aid interdepartmental coordination and document the cumulative benefits of state aquatic resource management actions. 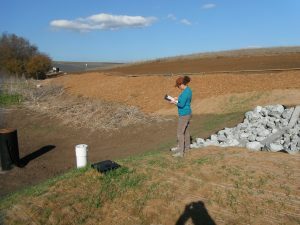 WRAMP incorporates tools designed to implement the watershed or landscape approach to project siting and design, project tracking, project assessment, aquatic resource mapping, ambient monitoring design, and reporting of aquatic resource condition. 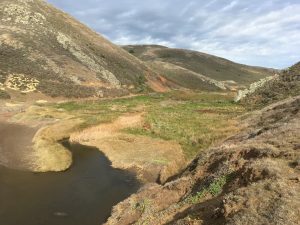 This request for funding will help CCWG and SCCWRP identify how the tools can help local groups improve wetland and riverine management within the Gabilan (Monterey County) watershed. Demonstrating the use of WRAMP tools to describe the current condition of this watershes and working with local stakeholders to get buy-in to use the compiled information to direct future restoration, management and conservation efforts will provide an example of the benefits associated with integration of standard tools for local decision making. Bar-built estuaries are the dominant estuary type in California, and many of these small estuaries are subject to closure with a sand barrier separating a lagoon estuary from the ocean for days, months or even years. This report was written to provide an overview of considerations for managed breaching in California. It presents a synthesis of processes and phenomena related to mouth closure and breaching in general and uses this to identify potential impacts of breaching, without intending any judgment of which impacts are more or less desirable. 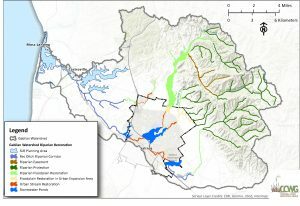 Three specific systems are reviewed in detail: Los Peñasquitos Lagoon in San Diego County, Scott Creek Estuary in San Mateo County and Russian River Estuary in Sonoma County. While there are fundamental similarities in the closure and breaching cycle across all bar-built estuaries statewide, there is also an immense diversity between these systems due to differences in size, in hydrology (wet north to dry south), and in development (rural, urban, agricultural, road/rail). 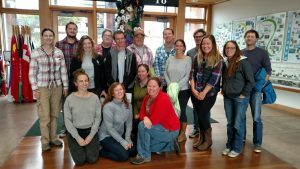 This project aims to add to our regional understanding of the current ecological services these systems provide to this coastal area of California. 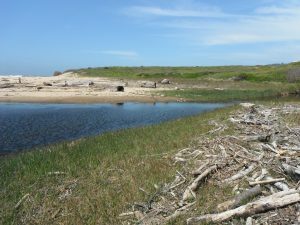 It builds off of an effort funded by the USFWS San Francisco Area Coastal Program in 2016, which assessed the condition of bar-built estuaries in San Mateo County. That project provided the USFWS San Francisco Area Coastal Program with several possible prioritization options to strategically allocate federal funding for on-the-ground efforts to improve habitat conditions of bar-built estuaries within the San Mateo coast focus area. 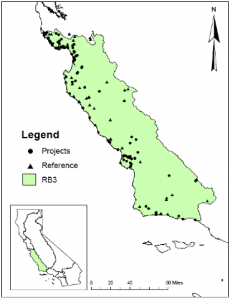 In addition, this document provides a summary of information available within the California Coastal Confluence database which describes the region’s BBE condition, use by protected species, and anthropogenic stressors of the bar-built estuaries and their watersheds. Bar-built estuaries (BBEs) are unique coastal wetlands that form at the mouths of coastal watersheds and provide a great diversity of habitat and ecosystem services. These important coastal wetlands provide critical habitat for many commercially important and endangered species and make up 51% of all coastal confluences in California. With a growing population, often centered on coastal confluences, these habitats experience varying degrees of alteration. Future alterations, increasing demand for freshwater and climate or sea level change further threatens BBEs and the services they provide. The diversity and dynamics of ecological services, and how they are affected by anthropogenic alteration is poorly understood. Understanding these details is necessary to ensure the long-term health and productivity of these coastal ecosystems. California State Parks (CSP) manages nearly half of California’s BBEs. Thus, by enhancing the capacity of State Parks to assess and manage wetlands in a cost-effective manner we will provide a major step towards increasing and preserving the quantity and quality of California’s wetlands. We propose to establish a wetland habitat restoration and management prioritization tool. We will create a comprehensive georeferenced database of BBE resources managed by CSP. We will combine these data with estuary water elevation, CRAM assessments and watershed stressor data to link watershed stress and local condition. This watershed approach will inform how watershed and/or local actions will increase habitat function within BBEs, and coupled with historical analyses will provide a valuable management prioritization framework to direct management of wetlands by CSP. This project will use CCWG-developed methods to assess bar-built estuary and associated watershed conditions and provide the Coastal Program with a prioritization regime to direct on-the-ground efforts to improve habitat conditions and species services for the bar-built estuaries and their associated watersheds within the San Mateo coast focus area of the San Francisco Area Coastal Program. Connecting marine, freshwater and terrestrial ecosystems, bar-built estuaries are complex and dynamic systems that provide a great diversity of habitat and ecosystem services. With a growing population, often centered on coastal confluences, these habitats experience varying degrees of alteration. Future alterations, increasing demand for freshwater and climate and sea level change all further threaten these habitats and the services they provide. 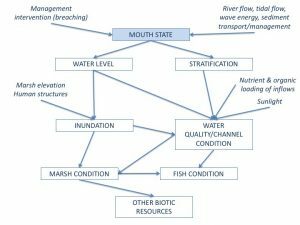 Being at the bottom of watersheds bar-built estuaries accumulate impacts from upstream stressors creating both a management challenge and a monitoring opportunity. Results of this project will provide the Service with summary statistics, and other statistical results to help prioritize and focus management within this region to maximize benefit to local habitat value, species services, and overall landscape condition. 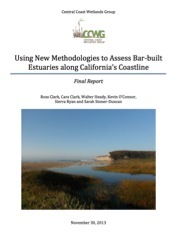 CCWG has been working over the past three years on compiling information, developing rapid assessment tools, and developing a geo-database for bar-built estuaries in California. In that capacity, the CCWG research group worked closely with The Nature Conservancy, the San Francisco Estuary Institute (SFEI), and the Southern California Coastal Water Resources Project (SCCWRP) to compare approaches and discuss existing geo-databases for California’s estuaries and other coastal confluences. The Nature Conservancy is engaged with partners to conduct a coast-wide assessment of the nursery function of West Coast estuaries. 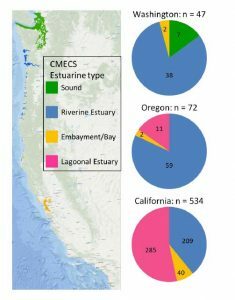 As a first step in that process, TNC is supporting the development of an authoritative geo-database of West Coast estuaries that can be used for this nursery assessment, as well as for other uses (eg. compiling rapid assessment data). TNC hired CCWG to work with key partners in California to assemble the California portion of the authoritative geo-database of coastal confluences on the West Coast. This work was done in consultation with partners at the Pacific Marine and Estuarine Habitat Partnership (PMEP) who are involved in the coast-wide nursery assessment. CCWG provided expertise on wetlands to the resource agencies to help them balance multiple species, physical and ecological processes and to evaluate the tradeoffs between various options for the bridge replacement. CCWG staff attended and presented data at multiple TAC meetings and workshops over the course of the project. 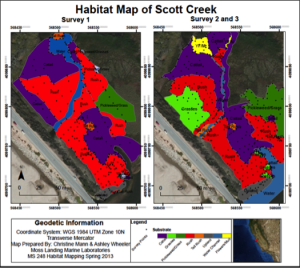 The end goal was to assist in the identification of a bridge replacement and restoration design for Scott Creek lagoon. 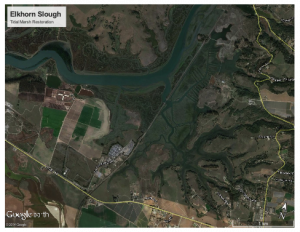 Ross Clark collaborated with Dr. Ivano Aiello of MLML as senior technical advisors to a large marsh restoration project in Elkhorn Slough being conducted by the Elkhorn Slough Foundation. Their general role included participation on conference calls and meetings, review of current scientific literature, review of draft document sections, and technical advice on marsh restoration alternatives. 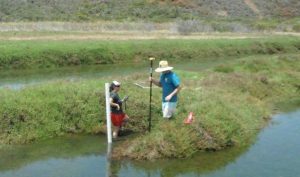 CCWG is collaborating with the Resource Management Division of California State Parks, John Largier at Bodega Marine Lab, and David Jacobs at UCLA to deploy temperature/depth loggers at bar-built estuaries on the north, central and south coast of California. These data are being collected to build a log-term data set on BBE water levels and breaching events. In some cases the logger data is being combined with marsh plain elevation surveys to estimate marsh plain inundation depth and periodicity. 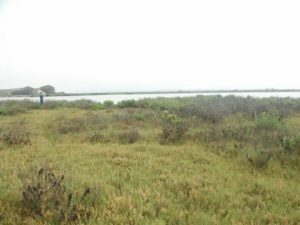 The Central Coast Wetlands Group conducted assessments of the condition of the Salinas River Lagoon marsh plain in 2012 and 2015. 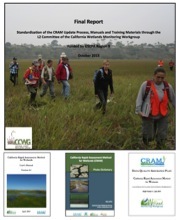 The California Rapid Assessment Method for Wetlands (CRAM) was used to conduct the assessments of existing vegetation and habitat at four sites on the marsh plain. 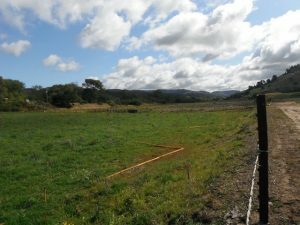 The Central Coast Wetlands Group teamed with Big Sur Land Trust to assist with pre-project implementation monitoring and quality assurance (QA) for their Carmel River Floodplain Restoration and Environmental Enhancement Project (CRFREE) with funding from the USEPA West Coast Estuaries Grant Program. 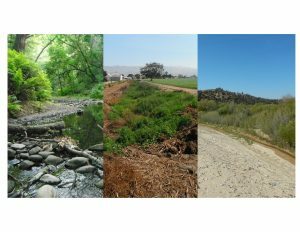 The California Rapid Assessment Method (CRAM) was used to assess existing vegetation and habitat conditions at four sites in the project area, located east and west of Hwy 1 on the Carmel River floodplain. Bird surveys quantified the species richness, habitat utilization, and bird species abundance. A continuous water depth logger was installed to monitor the water elevation of the river prior to restoration. 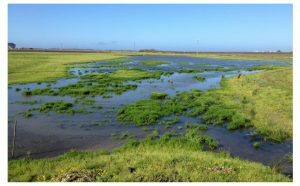 The objective of this study was to characterize the condition of wetlands at the Watsonville Slough Farms using the California Rapid Assessment Method (CRAM). The Central Coast Wetlands Group (CCWG) performed CRAM assessments at several sites including areas that are slated for future restoration, areas that have been previously restored, areas of the main Watsonville Slough, and multiple assessments at a site before and after restoration. The results of these assessments provide information for managers on the current condition of wetlands at the Farms and also show the success of restoration activities. Through the development of new tools to assess riparian habitat extent and condition, this project will pilot the State’s Wetland and Riparian Area Monitoring Plan (WRAMP) to better manage riparian and riverine resources, integrate multiple monitoring and regulatory programs and stand as a model for rural and agricultural regions around the state. This proposal is in part a response to RB3’s specific request to develop tools and capabilities that support their “Vision of Healthy Watersheds.” The resulting products will be 1) a Central Coast WRAMP implementation document developed by the Central Coast Riparian TAC, 2) An inventory of Central Coast Riparian Resources, 3) a draft methods paper for distribution to the CWMW recommending a set of procedures of a “Remote Riparian Assessment Method” for use with accessible and inaccessible riparian resources, and 4) a draft GIS modeling program that will enable the current Riparian Area Mapping Tool to reference and interpret aerial imagery. 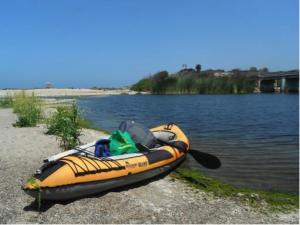 A pilot run of the expanded capabilities will take place in the Morro Bay watershed. The California State Water Resources Control Board and the Regional Water Quality Control Boards are examining the feasibility of adopting a Water Quality Control Plan for Wetlands (“Wetlands Plan”). Four demonstration projects are being conducted, and are focused on building scenarios of Plan implementation. This report presents the results of a project conducted in collaboration with Rich Sumner (USEPA) and the Central Coast Regional Water Quality Control Board ("Regional Board"). It includes a plausible scenario about how existing monitoring and assessment information may be used for reporting implementation of voluntary wetland and stream restoration projects. 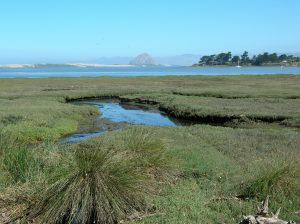 Those projects protect the beneficial uses of estuarine wetlands of Morro Bay. The scenario also describes how information may be used to determine site-specific need for stream riparian buffers that protect the same beneficial uses. Lessons learned from the "Morro Bay Wetlands and Watersheds Plan Demonstration Project" will be combined with results from demonstration projects conducted with other Regional Water Quality Control Boards. Through the validation of 3 additional modules of CRAM used to assess wetland condition (depressional, vernal pool and slope wetlands), this project will enhance the ability to state agencies to implement the State’s Wetland and Riparian Area Monitoring Plan (WRAMP), allowing them to better manage and assess wetland and riparian resources utilizing scientifically validated tools. 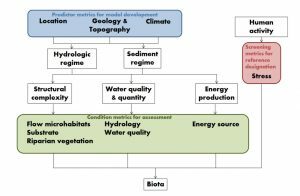 Validation provides the scientific evidence that CRAM modules adequately assess the potential of a wetland area to provide a broad range of ecosystem services as expected based on wetland type and setting. Without being validated, the efficacy of a module is essentially unknown because they lack the data and analysis to demonstrate that they accurately assessing wetland condition without error or bias. This project is designed to provide capacity to the State of California to assess net change in wetland extent and condition and demonstrate concepts in probability-based ambient survey of depressional wetlands.CCWG worked as a subcontractor to the Southern California Coastal Water Research Project on the task of the grant involving an intensification of USEPA’s NWCA in California. 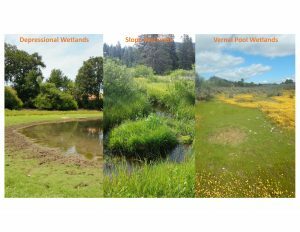 CCWG is ran both the NWCA protocol and CRAM at 8 additional sampling sites.CCWG also served on the Technical Advisory Committee assisting in the development of a unified wetland classification system for California and the design of a wetland status and trends program for the state. 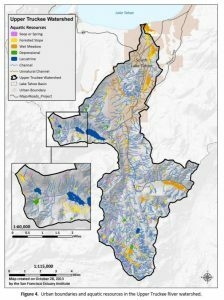 This project continues the development of a probability based “Status and Trends” program that will provide the State of California with the tools and capacity to assess net change in wetland extent and distribution over time. The ability to assess wetland change is the foundation for the State’s wetland monitoring and assessment program. It provides the means to evaluate the effectiveness of Federal and State “no net loss” policies and programs, and to guide adaptive modifications of those programs. . This project will build on those efforts by developing an agreed upon approach to assess net change. Second, this project will conduct the overall sample draw of Status and Trends plots for the State, conduct a pilot demonstration of the Status and Trends mapping and change assessment and produce a program document to guide future full-scale implementation. 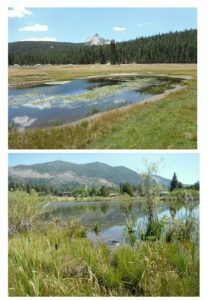 Develop training materials and presentations for a 3-day CRAM vernal pool training course for Placer County, California in April 2013. Support included the distribution of training manuals and field books to participants and a preliminary site visit to prepare for the training session. Production support for the development of four CRAM training videos. Primary video production came from EPA's Office of Multimedia. Training videos were shot for riverine, estuarine, depressional and bar-built estuarine wetlands at sites around the San Francisco Bay area. CCWG assisted with site selection, production of film notes, starred in the videos and helped refine the final products with aerial images and comments. A final report was prepared addressed issues or concerns related to CRAM implementation, estimates of additional funding needs, and any programmatic recommendations that could be of use to EPA, USACE, or state partners involved in the use of CRAM in their respective regulatory programs. 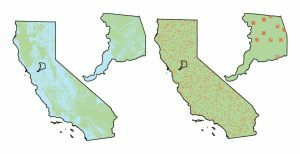 In collaboration with the State and USEPA, California regional teams have developed analytical tools and assessment methodology that provide important statewide data for aquatic resource management. Until now, these tools have been targeted at riverine and estuarine systems. On the Central Coast of California, creek mouths and bar-built estuaries (a.k.a. lagoons) provide unique and valuable services to freshwater and marine species and are uniquely susceptible to adjacent land use impacts and pollution.This project seeks to address four priority tasks: 1) Create a classification system and complete an inventory of bar-built estuaries throughout California (initial tally includes over 200 such systems on the central coast alone); 2) Verify and validate the California Rapid Assessment Method (compare results with Level 3 data) for lagoons; 3) Test the Level 3 sampling protocols recommended within the conclusion of the Santa Cruz County Comparative Lagoon Ecological Assessment Project; 4) Conduct an ambient assessment of Central Coast lagoon condition throughout the State. As a result of this grant, CCWG has expanded its research on these systems. Please see the Bar-Built Estuary Research page for more information. The purpose of this project was to develop a “verification version” of the Depressional Wetland CRAM module, and test it on a number of sites during the summer of 2012. Analyses of the statewide CRAM results were based on the relationship between CRAM scores and expected condition (stress) across a range of hydroperiod. The results were analyzed in terms of the ability of a metric, the attributes, and the overall index score to differentiate between good, medium, and low quality sites. Recommendations to modify the module based on the performance analyses were vetted with the Depressional CRAM Team and, once approved, were brought to the statewide Rapid Assessment Committee for final review.This project is a task within a much larger grant funded by the Coastal Impact Assistance Program through the USFWS. CCWG worked as a subcontracter through the San Francisco Estuary Institute. 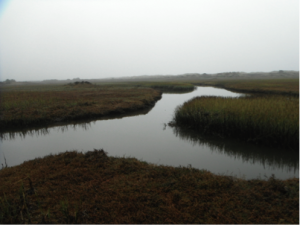 The Southern California Coastal Water Research Project (SCCWRP), with the Central Coast Wetlands Group will develop the conceptual assessment framework for episodic streams in California. More than two-thirds of California’s streams are characterized by episodic flow, and therefore excluded from current ambient surveys because of the lack of appropriate assessment tools. Activities will include development of new tools and/or modification of existing tools for assessment of episodic stream types in California. All activities will be coordinated through the existing interagency workgroups, including the California Wetland Monitoring Workgroup (CWMW). This project is funded by a USEPA Region 9 Wetland Program Development grant. CCWG is the co-lead on a project to develop a CRAM module for wet meadows. CCWG is partnering with SFEI and the Lahontan Regional Water Quality Control Board in this process. Wet meadows depend on groundwater rising into the root zone long enough to create hydric sediment conditions that favor wetland vegetation. 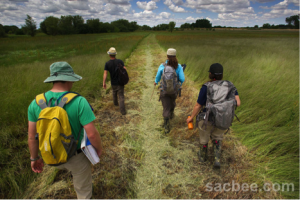 The most common functions of wet meadows include flood control, water supply, climate change mitigation, water quality control, groundwater recharge, erosion control, fish and wildlife support, recreation, and grazing. Produce a report that describes the ecological condition of the Nation’s wetlands. Assist states and tribes in the implementation of wetland monitoring and assessment programs that will guide policy development and aid project decision-making. 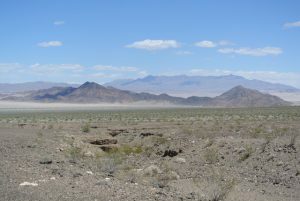 This project will develop an approach for integrating existing biological assessment tools, such as benthic macroinvertebrate and benthic algal indices of biotic integrity (IBI), physical habitat assessment (PHAB), and the California Rapid Assessment Method (CRAM), to provide an overall assessment of ecosystem condition for riverine wetlands. In addition, this project will begin to develop a stressor index that ultimately could be used to inform management decisions aimed at improving ecological condition. The index will holistically assess the streambed, adjacent wetlands and associated riparian habitats independent of jurisdictional or agency boundaries. The project will build upon existing efforts such as the State of California’s Reference Condition Monitoring Program (RCMP) and Perennial Stream Assessment (PSA). The goal of this project was to develop a network of wetland reference sites for the state of California. Grant activities focused in southern California (South Coast), Central Coast, Sacramento-San Joaquin Bay Delta (Central Valley), Northern California (San Francisco Bay; North Coast as a subset of the Klamath bioregion), and the Sierra bioregions. This included reference sites for riverine, estuarine, bar-built estuarines, depressional and vernal pool wetland types. The sites selected will be used for training and calibration of CRAM practitioners. CCWG worked as a subcontractor to the Southern California Coastal Water Research Project to establish the reference sites on the Central and North Coasts. Aquatic resource management depends on a comprehensive understanding of watershed condition. Unfortunately most monitoring and assessment is based on a single objective (e.g. regulatory compliance) or a single indicator (e.g. benthic macroinvertebrates). To remedy this, the USEPA has proposed a three-level framework for wetland monitoring. Level 1 consists of habitat inventories and landscape-scape assessment; Level 2 consists of rapid assessment; and Level 3 consists of intensive assessment. 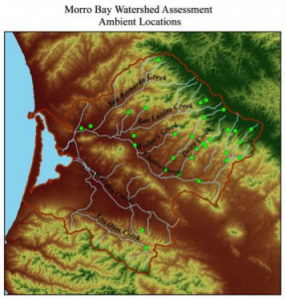 This integrated assessment approach was demonstrated in the Morro Bay Watershed, near San Luis Obispo, California using a series of wetland assessment tools developed by the state over the past five years. Demonstration of the three-tiered assessment in the watershed achieved three goals: 1) A synopsis of the extent and geographic distribution of the riverine wetlands and their associated riparian areas, 2) a probability-based survey of the ambient condition of the riverine wetlands and their associated riparian areas, and 3) an assessment of the status of a set of riverine restoration projects relative to the watershed ambient picture. Funds supported the development of a central coast regional component for the California Rapid Assessment Method for wetlands. Similar work occurred simultaneously in the San Francisco bay Area and the Southern California Bight with project partners from SFEI and SCCWRP. The long-term goal of this inter-regional collaboration is to develop a statewide monitoring program that will track status and trends of wetland quality and condition. This project helped to build institutional capacity to assess the extent and condition of the State’s wetlands.